There’s a new kid on the block. Garmin has finally released the Garmin Approach S60 golf watch and it does not disappoint. This golf watch is jammed to the brim with impressive technology and is leaps better than the already impressive Garmin Approach S6. Garmin has definitely taken the golf watch to the next level and offers you its patented accuracy with new multi sport functionality. Without sacrificing the quality of any features that make Garmin golf watches the best, they’ve added a ton more. The features of the Garmin Approach S60 are unmatched by competitors and Garmin has proved (once again) that they rein supreme in the world of golf watches. As long as you don’t mind the price tag, this watch will provide you with everything you need on and off of the golf course. Without a doubt, this is the best golf GPS watch of 2017. 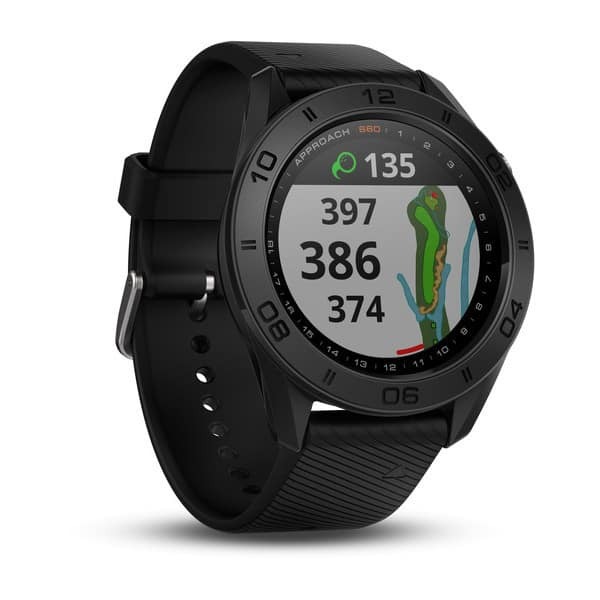 As you’d imagine, the Garmin Approach S60 displays the yardage to all layup positions, hazards, and doglegs on the course. The clear color touch screen allows you to easily spot hazards. Garmin introduced this technology with the Garmin S6 and, if anything, has refined the accuracy and clarity. You can narrow yardages down to exact numbers, leaving no guess work. Wan’t to know how many yards it is to the front, middle, and back of the bunker? No problem. The same goes for any other hazard and any portion of any fairway or green. This technology is extremely valuable when playing a golf course for the first time. We’ve all estimated the yardage to a creek only to come up short and lose a golf ball. With this golf watch, that’s no longer a problem. Garmin has never cheaped out and charged customers fees for downloading courses to the golf watch or downloading watch updates. With the Garmin Approach S60, they have continued the trend of providing customers with a golf watch pre-loaded with tons of courses. Much like the Garmin S6, the Garmin Approach S60 comes pre-loaded with over 40,000 different golf courses across the globe. You can head to the golf course and use it as soon as it’s charged. The Garmin Approach S60 auto-recognizes courses as soon as you enter golf mode. And an improvement between this watch and the Garmin S6 is that it recognizes golf courses even faster. The Garmin Approach S60 features a fully color 1.2” (30.4 mm) diameter display size with 240 x 240 pixels. This is a fairly significant improvement over the Garmin S6 which boasted 180 x 180 pixel resolution. The watch weighs 1.8 oz and includes 1 GB of memory. As we said before, everything displayed on this watch is crystal clear. The Garmin S6 blew people’s minds and the resolution on this golf watch is even better. You can be fully confident that you will be able to fully interact with this golf watch without being frustrated by the functionality of the screen. Despite offering more power, more features, and more pixels, the Garmin Approach S60 golf watch does not sacrifice any battery life. The Approach S60 will last for up to 10 hours in GPS mode and up to 10 days in smart mode before needing a recharge. This means that you can play two full rounds with this golf watch before recharging. The battery on this golf watch is a rechargeable lithium-ion battery that plugs right into your computer or any usb charging unit. If you just use the watch as a basic watch, it can last much longer than 10 days, but it really depends on how you use it. Because the Garmin Approach S60 is also compatible with TruSwing technology, it also features swing speed and club path analysis. This will allow you to figure out your swing speeds with various clubs without the need to go to a trainer or to a golf store where they’ll guilt you into buying something. The club path feature is also fantastic for analyzing your swing plane. It will tell you if you’re coming in too steep (causing a slice or pull) or to flat (hook and/or skull). TruSwing also offers a ton of other analysis of your golf swing. Buying this watch without TruSwing is still a great deal, but you can’t fully take advantage of the benefits without it. This Garmin Approach S60 allows you to keep your score on the watch itself. This is a great feature that eliminates the need for scorecards. Because the watch comes with 1GB of memory it will store several rounds of golf before needing to be uploaded to a computer for analysis. This feature really gives you an accurate picture of your golf game and what your real handicap is. No more faking your score and guessing your handicap. 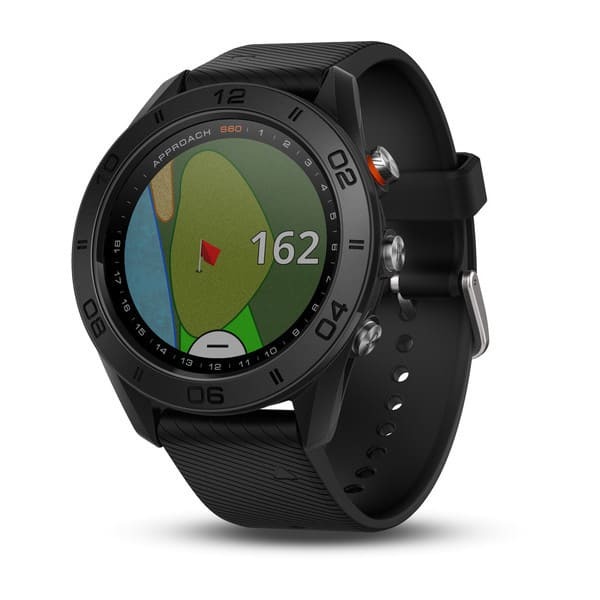 This golf watch offers you real analysis that you can compare with your buddies through the Garmin connect phone app. Another one of the great new features (sensing a trend yet?) with the Garmin Approach S60 is its activity tracking technology. Not only will this golf watch accurately track your heart rate (with the purchase of an accessory), but it will also track activities other than golf. This golf watch comes preloaded with technology that can accurately track you while skiing, snowboarding, XC Skiing, stand up paddleboarding, rowing, indoor rowing, swimming, walking, running, riding a bike, as well as other activities. Garmin basically took some of the best technology from their running and overall activity watches and added it to this golf watch. When you consider that Garmin charges about $600.00 for their activity watches, the price tag for the Garmin Approach S60 suddenly becomes appealing instead of burdensome. The Garmin S60 actually does track heart rate if you have an accessory that you pair up with it. 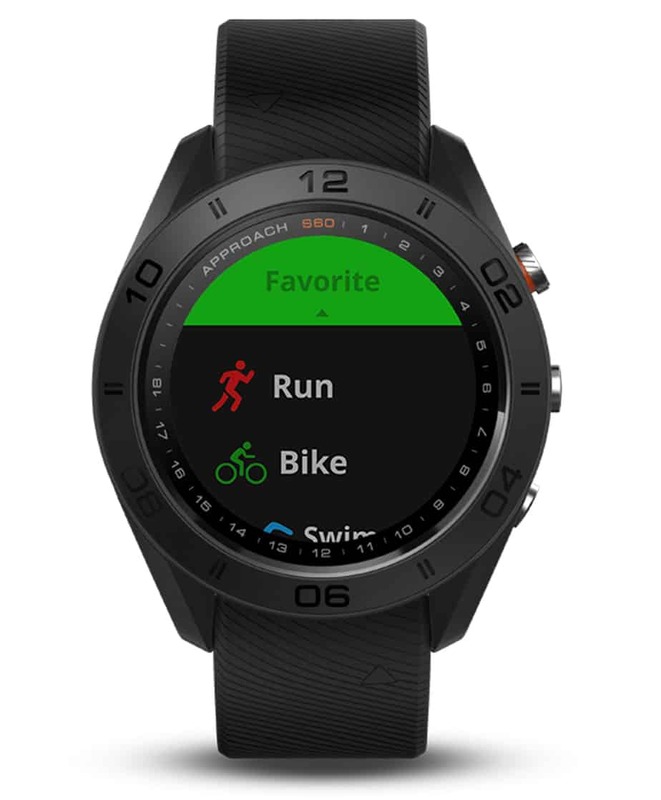 It also has other multi-activity functions that allow you to accurately track your activity for running, biking, swimming, golfing, and loads of others. If this watch is a little too steep for you in terms of price, but you still want the heart rate monitor technology, check out the Garmin X40. The X40 has the heart rate already built in without the need for an accessory. 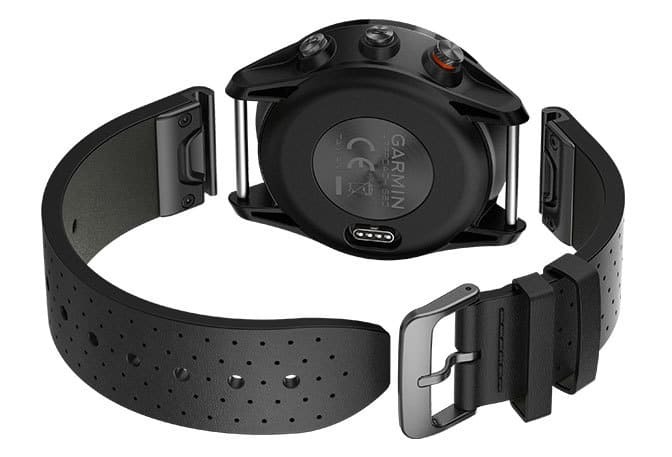 Any heart rate monitor can be used with the Garmin device. I have a $10 heart rate monitor that i use when i want to pair mine. How is it comparing to Fenix 5? I’ve heard people saying if paying this amount you might as well get the all-in-1 Fenix 5. They both look quite similar and There are tons of infos/vids about the Fenix 5 but not the S60. I know S60 is targeted to golfers, which I am, I still want to know which has a better value/user experience. I really can’t decide between these two. Great question, Harald. The Garmin Fenix 5 certainly offers you more non-golf-related features than the Garimin s60. 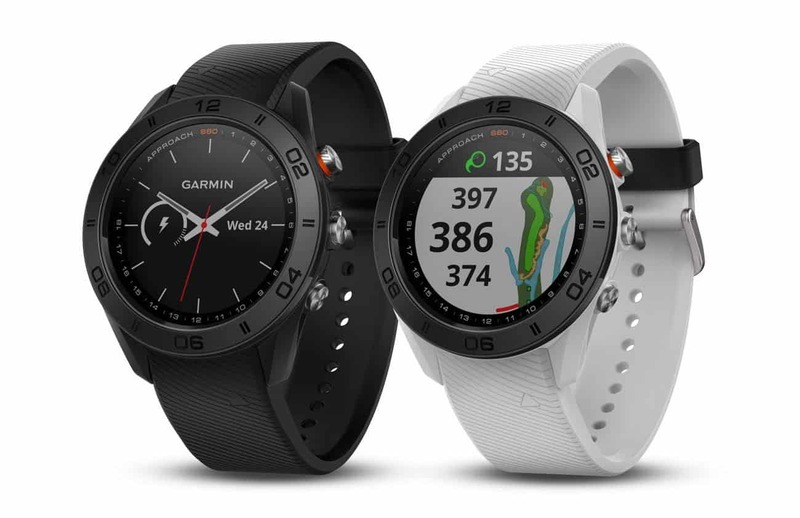 The Garmin S60 was principally built for golf and the other features are an added bonus due to the watch’s price point and capacity to handle so much tech. With the Fenix 5, my opinion is that its the other way around. The Fenix 5 was principally built as a hikers/runners/training watch and Garmin threw golf in as a feature because the watch can support the technology and because Garmin is so good at making golf watches. I personally wear a Garmin S60 golf watch rather than a Fenix 5. It came down partially to cost, but mainly to the fact that on the Fenix 5 you have to preload a golf course into it before playing. With the Garmin S60, the watch comes pre-loaded with over 40,000 golf courses. I personally didn’t need all of the fancy altitude functions and other tech in the fenix 5 and really don’t like thinking about preloading courses before i golf. When you add in the extra price, for me, as a golfer first and everything else second, it was a no brainer to stick with the Garmin S60. Hope this helps! Well said Kyle , couldn’t of said it better myself . Ive had both the Fenix and now the S60 , The Fenix doesn’t come close to what the S60 can do on the Golf course . For everything else , the Fenix is the best smart watch in the world . mine cannot connect to my smartphone and computer and it seems that it’s bluetooth feature does not work. any advice? You’ve probably tried the obvious, but I recommend powering it off and back on again. Make sure you’ve downloaded the Garmin Connect app on your smartphone. From there you should be able to pair it with your device. If you continue to have trouble, please contact the manufacturer as you may have a defective device. I’ve personally never had any trouble with mine, but that doesn’t mean it cant happen. Let us know how it turns out! How does the S60 get updates on courses? Via the bluetooth connection with the smartphoen app? I have a golfbuddy but the updates were via USB and this takes forever and it usually hangs! How would you rate the S60 vs the WTX? Price is the major difference – WTX cheaper; but would the extra features on the S60 really make up for the price differential? The Garmin S60 gets automatic updates as you wear it or as you sleep via a bluetooth connection to your phone. In fact, it is unnecessary to plug it into a computer whatsoever. I would rate the S60 far and above the WTX. The GolfBuddy is still working out the kinks on the watch. It has a clunky feel (as in size) and its display of the course looks like a video game from the 90s. It also doesn’t have drag and drop tech to the pin, automatically powers off to save battery and does a few other things that are just annoying. The S60 is definitely the way to go if you really want a nice GPS watch. Is the watch feature visible in the dark? Hi Sam – it sure is. It has a backlight that lights up at the touch of a button. No information about a user replaceable battery or lack thereof!!!!!!!!!!!!!!!!!! What do you do when the battery needs replacement??????????? The battery cannot be easily replaced by users, unfortunately, but Garmin does have a replacement program which can be read about here: https://support.garmin.com/en-US/?faq=LLgTVPWsPH7tc5v4lwEST9. That being said, I’ve had mine for two years and it works just like the first day I purchased it.